Tonight was closing night for venerable Ciao Mein. We had planned to eat one last time last weekend (which we did). But had second thoughts and made reservations for tonight too. The restaurant was offering a set menu special which we took advantage of. 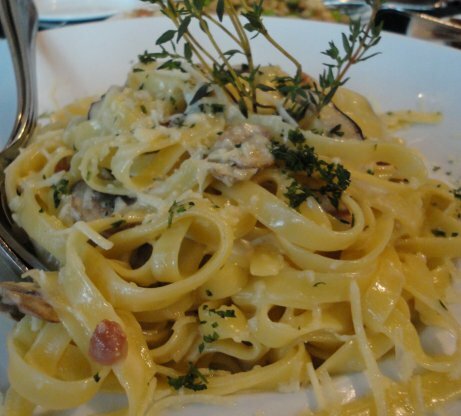 This is what we ate last week. The Cat really liked this (anything having to do with fresh seafood done well and The Cat is there). Back in 26 December 2010, I posted about the soft shell crab tempura salad we had at Ciao Mein which The Cat is still raving about. 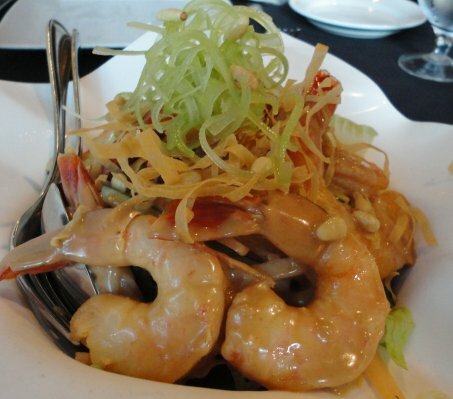 The soft shell crab tempura is still number one in The Cat’s book, but this tea smoked shrimp (with the dressing) comes in a close second. The Cat liked the crispy pancetta with the pasta (I think this is the first time she’s had pasta with crispy bacon, how deprived). 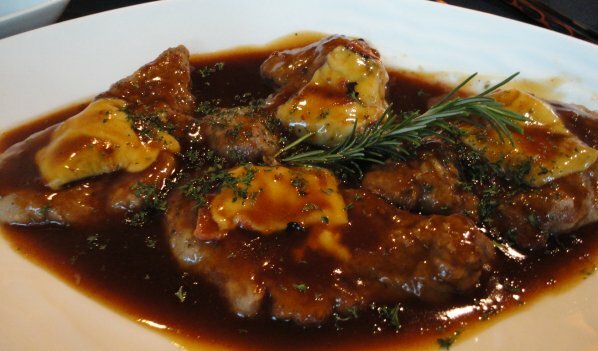 The menu gave us a choice of Saltimbucca de Vitello (veal scallopine with sage) or warm water lobster tails in a black bean sauce with asparagus. Since there were the four of us (we invited our friends Dr. T and R to join us), it was two orders of the veal and two orders of the lobster. Of course we had to add this. 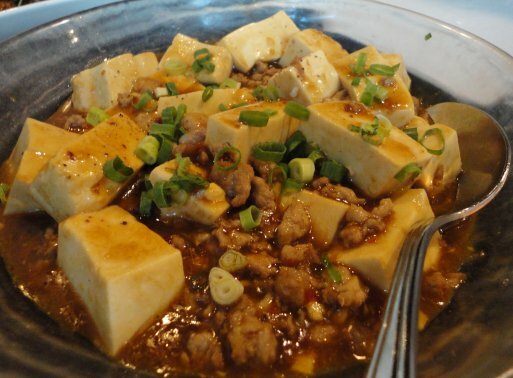 Lately, I’ve been in a Ma Po Tofu state of mine so we tried one order. You can order it mild, medium, or hot, we ordered it mild. I think we could have ordered it medium. 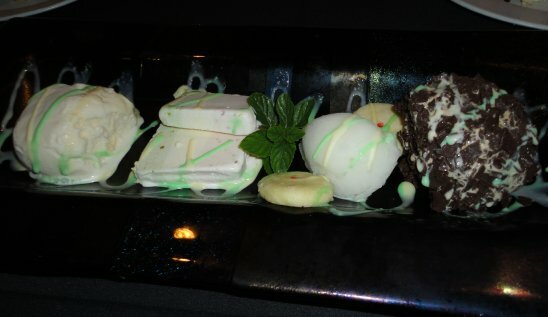 Dessert was tiramisu as part of the set package. At this point in time, I thought that was the last time we would see Ciao Mein. To back up a bit, the night we went, both our favorite server, G W (not his real name, changed to protect the guilty) 😉 and Chef C were off that night. During the week, we decided to go for one last time on the last night. When we called for reservations we wanted to see if G W and Chef C would be working. Chef C got on the phone and said not to worry about the menu, he would take care of it. Tonight, we trusted our palates and stomachs to Chef C, no menu required. 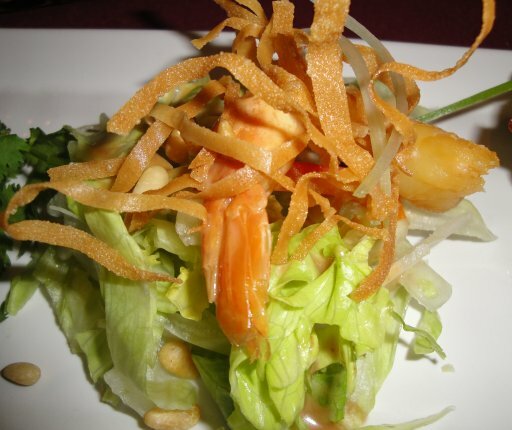 From left, salt and pepper shrimp, tea smoked shrimp caesar salad, and Beijing duck with foie gras. OMG! This was as good as the last time, there were even toasted pine nuts. 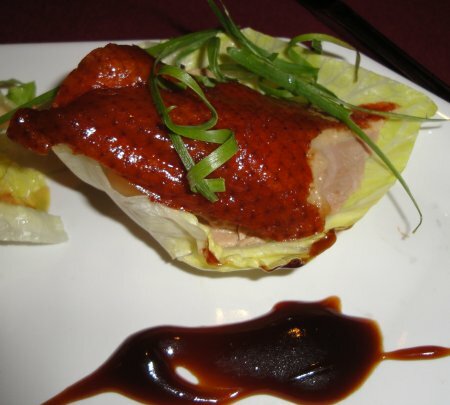 To us, this is one of Chef C’s career defining dishes. A fusion of Chinese and French, well done. 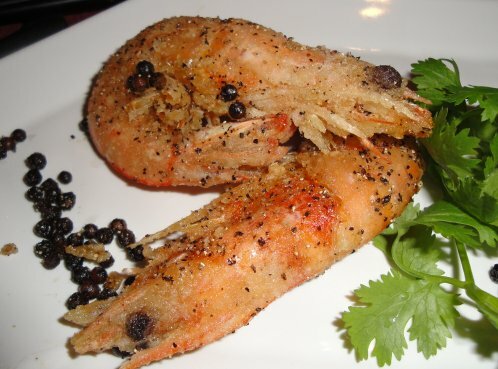 Happily, this may be on the menu when the new restaurant opens in several months. Sorry couldn’t get the name of this dish. 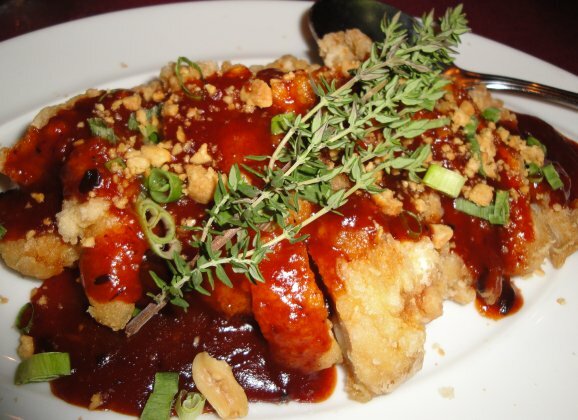 Fried chicken with a sweet and spicy sauce, topped with chopped roasted peanuts. The mussels were done well. 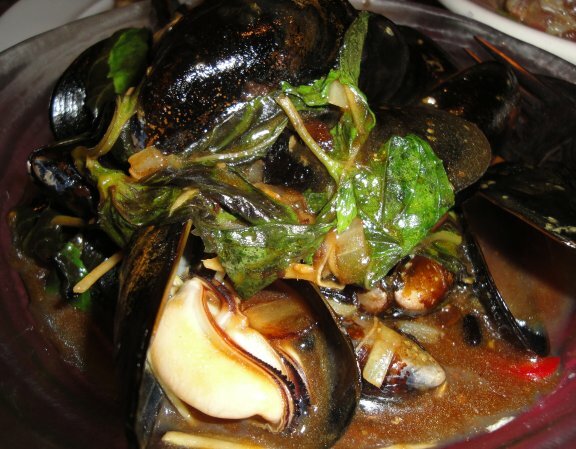 The Thai basil added a different layer of flavor to the black bean sauce. Fresh, moist, tender. The Cat got the head and tail. 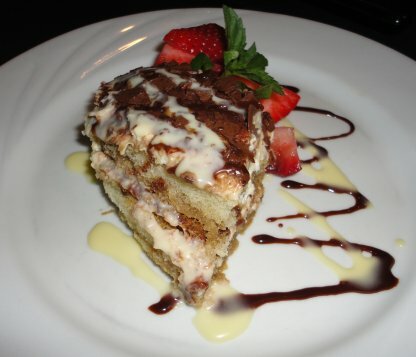 We ended with tiramisu and the Marco Polo. Was there any doubt? They let us take a few dishes and a pair of chopsticks home for souvenirs. Ciao Mein, Xie Xie, Grazie! 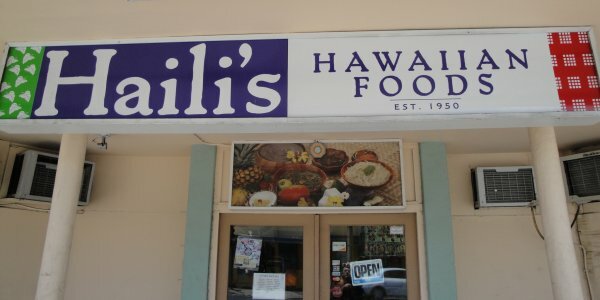 and Mahalo for the terrific food, outstanding service, and wonderful memories. We will always remember. Ciao Ciao, Zai Jian, Aloha. The other day, I was running errands around lunch time near here. I haven’t eaten here since they moved from their old location. 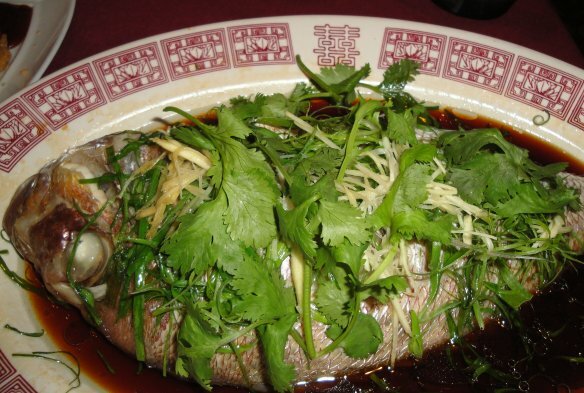 My favorite Hawaiian dish is lau lau. It has to be pork. 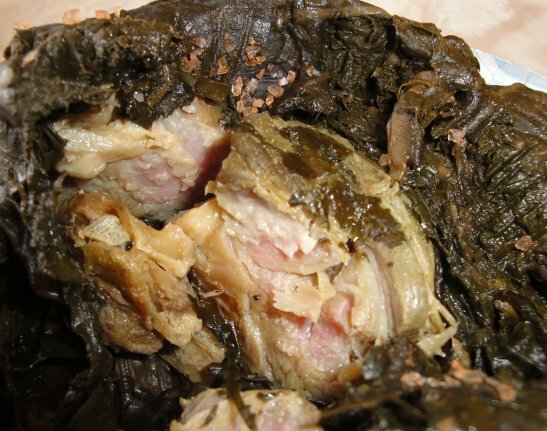 I’ve seen and tried lau lau with other fillings, sorry they just don’t float my boat. 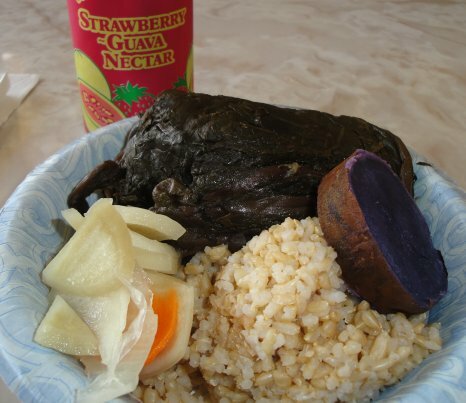 So, on this day, lunch was lau lau bowl, with a can of strawberry guava drink. I opted for brown rice. The bowl included pickled onions and a slice of Okinawan sweet potato. The pickled onions was a very good touch and the sweet potato was good for “dessert”. The last time I ate lunch with my cousins (see 20 April 2011 post), there was this house made spicy sauce that was intriguing. From the taste and responses from the restaurant staff, we were able to figure out possible ingredients: ground black sesame seeds, oil (not sesame), and chili. The other night I tried to recreate the sauce. ground sesame seeds, ichimi tōgarashi, peanut oil, pinch of salt and sugar. Sorry did not measure, added until it felt right. 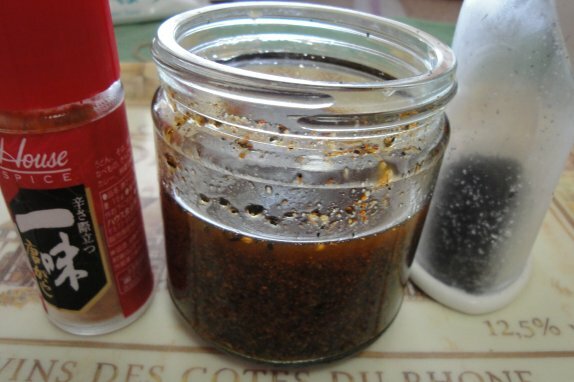 On the left is the ichimi tōgarashi, on the right is the sesame grinder with black sesame seeds, in the middle, my take on spicy sesame sauce. My version turned out spicier than the original but overall, I think I came pretty close. Hope P likes it. Enjoy (accompanied by evil scientist laugh). 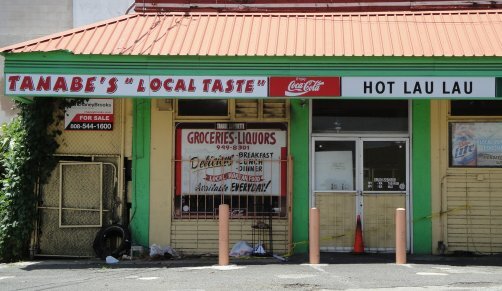 I was driving on Keeamoku Street today and noticed this place looked abandoned with a “for sale” sign posted. My suspicion was confirmed here. Another venerable establishment gone. Sigh. One of the dishes made at the Ronald McDonald House (see 24 April 2011 post) was cucumber wakame salad. 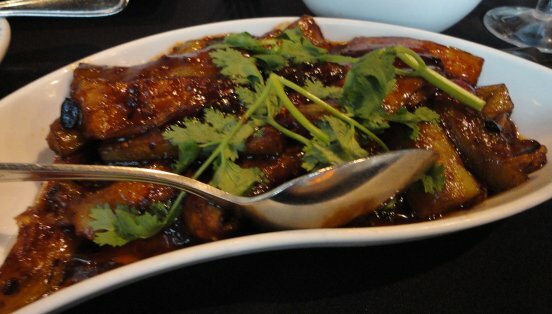 The dish was inspired from Japanese style namasu (vegetables with rice vinegar dressing). Since The Cat couldn’t attend that night, I made a small portion for her dinner last night. 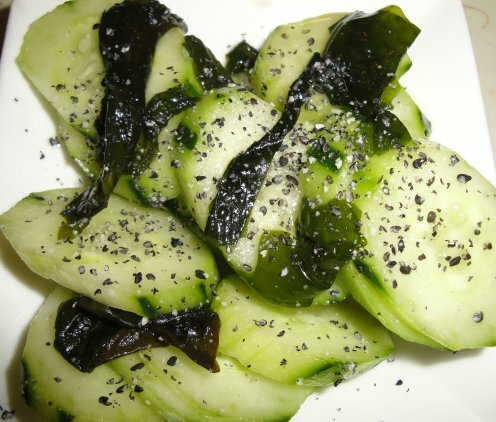 One cucumber, sugar and salt, reconstituted wakame seaweed, rice vinegar, and ground sesame seeds. Except for the cucumber, everything else is to taste. 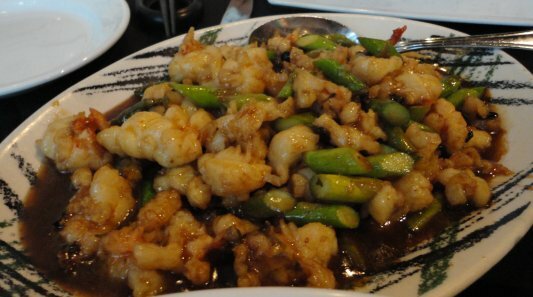 Without the wakame, the sugar and salt ratio is approximately two to one. since the wakame naturally a salty taste, I cut the salt significantly. If you need a recipe, here’s one that’s easy to follow. Instead of English cucumber, I used a Japanese cucumber. Plus, I didn’t seed the cucumber. I think the seeds in the Japanese cucumber is easier to eat than the English variety (just my opinion).